Thermally sprayed coatings offer a promising approach as efficient method to increase the wear-resistance of sheet metal forming tools. However, the roughness of thermally sprayed surfaces is quite high. The use of these coatings for deep drawing tools results in poor sheet surface qualities and low drawing ratios. Because it is suspected that high friction is the reason for the low drawability, hard metal coatings (WC–12Co), deposited by high velocity oxygen fuel flame-spraying, were machined by grinding and ball burnishing to improve their friction behavior and the accuracy of the tool shape. The investigation was conducted by plane strip drawing tests. Strips of high strength steel were mated with these novel and effective coatings at different normal contact pressures and drawing velocities. Uncoated friction elements made of C60 steel were considered as reference during the analysis. The results revealed that coated but unmachined friction elements showed high friction values, which led to scratch marks on the sheet surface after drawing. Applying the finishing processes, the friction coefficient could be reduced significantly. Additionally, deep drawing tests were carried out to determine the drawing ratio for coated, unmachined as well as for processed, coated dies. Thermally sprayed and ball burnished as well as thermally sprayed and ground coatings are feasible for deep drawing. Due to the post treatment, the drawing ratio β = 1.8 was increased to 2.0. This is consistent to the results of the friction tests. This work within the scope of subprojects A3 and A5 of the Collaborative Research Center (SFB708) “3D-Surface Engineering of Tools for Sheet Metal Forming—Manufacturing, Modeling, Machining” is kindly supported by the German Research Foundation (DFG), the central public funding organization for academic research in Germany. 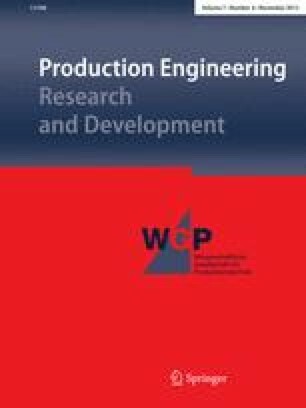 The authors would also like to thank Peter Hollingsworth from the Chair of Materials Engineering of TU Dortmund University, Germany, for preparing the thermally sprayed coatings.